Creating world champions and everyday heroes. Over the past decade, Well-Fit has helped thousands of athletes cross the finish line. Led by Sharone Aharon, a USA Triathlon Elite Level III coach and personal trainer, Well-Fit is a community of 200+ coaches and athletes training and racing together. We believe there is no finish line. Being an athlete is a lifelong journey. We’re here every step of the way, with resources to help you get started, grow stronger and get faster. Well-Fit will take you through every step of the journey — from the initial day of training all the way to the medal placed around your neck at the finish line! Programs ongoing throughout the year. Since 2005, we’ve helped hundreds of 1/2 Ironman athletes cross the finish line. Well-Fit’s Ironman training program is designed to provide comprehensive training and support to successfully complete an Ironman. Whether you’re looking to take on the challenge of completing your first triathlon in 2018 or trying to improve your performance from last year, our group programs have helped hundreds of athletes set a personal best! The program is designed to encourage young athletes (ages 7-15) to embrace a healthy lifestyle through a fun and engaging triathlon team program. Summer programs now available. Now accepting applications for the 2018 season. If you are a high-performing athlete looking to train with other advanced level athletes to help you break through plateaus and improve your race results, then the Well-Fit Elite Program is for you. Whether you want to complete your first triathlon or make dramatic improvements over prior performances, private coaching can take you there. 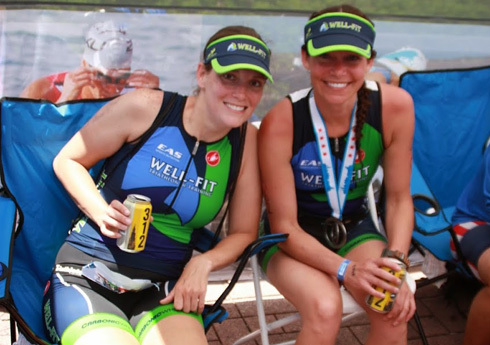 Well-Fit’s group trainings are designed to provide you with comprehensive training and support to successfully complete your triathlon of choice. Classes are offered every day so you can train with your schedule. Whether you are a beginner or an elite, Well-Fit’s classes will take your performance to the next level. Join some of the best trainers, coaches and athletes in the country. No matter what your budget or ambition, Well-Fit has a membership level that is right for you.